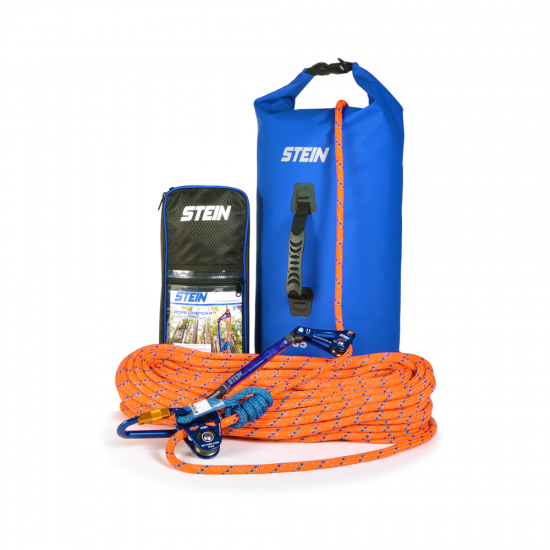 The Stein Rope Wrench kit features a CE marked rope wrench and tether, hitch pulley, karabiner and friction cord all contained in a protective storage bag. 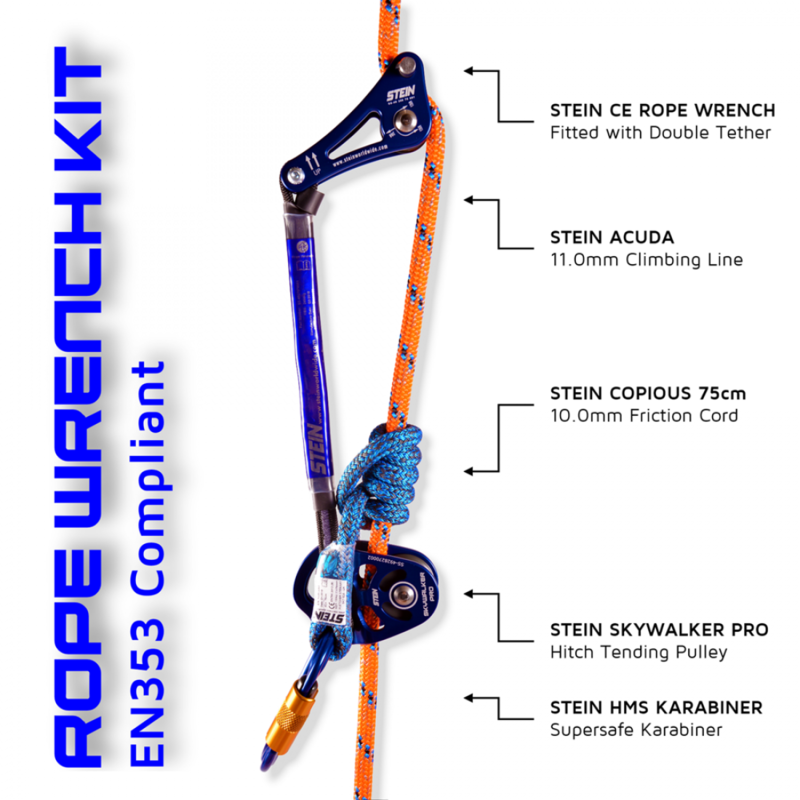 The kit components give the climber an EN353 compliant system when the kit contents are not diverted from; when a Distel hitch is used; and when it is used on STEIN Acuda climbing line. This will replicate the exact set-up used during testing to receive compliance. 1 x SS-4928070010 - STEIN EN353 Compliant Rope Wrench Kit. Supplied in a specially designed carry bag with foam insert to protect the components. Following the well-publicised intervention by the German Trading Standards authorities ISC were asked to address the issue of the Rope Wrench not being CE marked. Liaising between the German Authorities and the UK Notified Body SATRA for CE testing the Rope Wrench now carries a CE mark. This CE marking is done under the PPE Directive 89/686/EEC and EN12278 Pulley Standard and, for unavoidable reasons of test methodology, it applies to a combination of tether and wrench. When supplied without one of the approved Tethers, the Rope Wrench will not feature a CE Mark, but can only be sold in to countries where CE Marking is not mandatory and where customers in those countries are not forced to buy the approved Tether. NOTE: The testing was carried out with an MBS of 24kN which additionally means that the combination of tether and RW exceeds the ANSI minimum strength test criteria of 5000lbs. the responsibility of the reputable manufacturer using an ISO 9000 system as their means of ensuring that neither does CE marking suggest that the product is fit for purpose in the marketplace - that is the responsibility of the manufacturer during the development phase to ensure they have trialed and evaluated the product fully. Since ISC manufactures under an ISO 9000 system and since ISC worked alongside Kevin Bingham of Singing Tree and widely consulted industry user groups during the development phase/ anyone who currently has a non-CE marked Rope Wrench can be sure that it is safe to use and there is no need to return it. The issues of constraint are applied almost uniquely to the re-seller and we are addressing that with them now. During the development phase ISC became aware of a ruling (RFU) by the VG11 Group (a group which consists of representatives from all Notified Bodies in the area of 'Protection against Falls from a Height'). Solutions are proposed on technical issues and recommended for use by all Notified Bodies under the form of Recommendations for Use' which are submitted to the PPE Expert Group for approval, and published by the European Commission on their website. The relevant RFU is CNB/P/I1.088, dated and approved by VG on L2/|O/2O71 (later approved by HCOB/lO/2072, approved by PPE Expert Group L2/03/20t3). This states that a system that relies on knots being tied by the end user are not suitable to be certified, as they rely on techniques. This effectively meant that ISC were unable to CE approve the complete system which is why it was never done. Indeed subsequently ISC have contacted many test houses to see if that has changed and it has not. Therefore, the complete system is not CE approved/marked. However, we can confirm that the system as set up in the 'Recommendations Document' which was in written in 2O14 on behalf of and in conjunction with the ISA Technical Advisory Committee (TAC) to allow the system to be sanctioned as safe for use in competitions, was extensively tested in accordance with the relevant European Standards (EN12841) and meets or exceeds the performance criteria of said Standards and therefore is safe/fit for purpose. 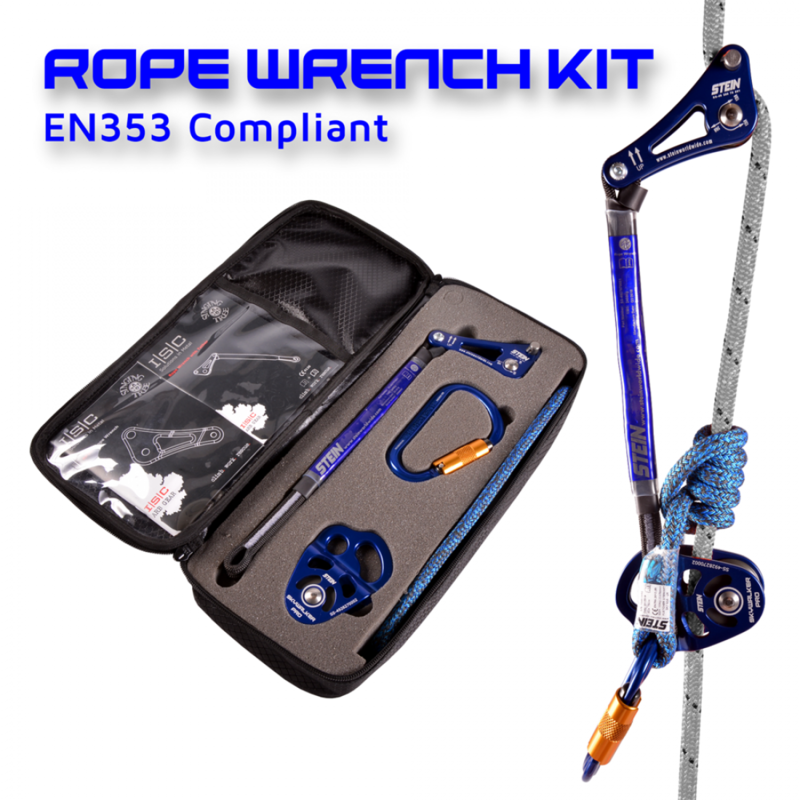 We are of course aware that the industry uses a huge variety of Hitches and of course it is the Hitch that dictates the effectiveness of the whole system - the Rope Wrench itself is not a fall arrest device it is a friction management device. Since Hitches are not within our field of specialism and at least in theory cannot be CE tested and approved, the user should satisfy themselves (in conjunction with the hitch cord manufacturer, their industry association and industry best practice) that the Hitch they prefer to use is effective as a means of fall arrest (with or without the rope wrench).